The outbreak of Ebola in West Africa hit the headlines in 2014. This highly contagious and deadly virus spread rapidly through Guinea, Liberia and Sierra Leone. It quickly became clear that only a military contribution could help to respond with the speed necessary to contain the outbreak. Britain's response focused on Sierra Leone due to long-established links with the country, including the presence of a small security advisory team. Operation 'Gritrock' was launched in September 2014 to help organise the response and to rapidly build Ebola treatment centres. Military medics were sent to treat healthcare workers and staff tackling the outbreak and offer training, with soldiers providing security. By November 2014, around 900 personnel had arrived. The British military came under civilian leadership and worked closely with non-governmental organisations (NGOs). All of these efforts were to supplement the work of the Sierra Leonean government and its people. On 7 November 2015, Sierra Leone was declared free of Ebola by the World Health Organization (WHO) after 42 days without a single new reported case. However, the disease has caused lasting damage to the country and the region. Included here is just some of the material relating to Operation 'Gritrock' and the response to Ebola in Sierra Leone collected by IWM's Contemporary Conflicts Programme. British military personnel disembark at Lungi International Airport near Freetown in Sierra Leone, September 2014. British military personnel disembark from an RAF C-17 Globemaster at Lungi International Airport near Freetown in Sierra Leone, September 2014, at the start of Operation 'Gritrock'. The speed at which the British armed forces could deploy and the variety of roles they could perform were key factors in military intervention in the outbreak. Download a transcript of this interview. Engineers during the construction of the Moyamba Ebola Treatment Centre in 2014. Engineers of 62 Works Group, Royal Engineers and of the Republic of Sierra Leone Armed Forces during the construction of the Moyamba Ebola Treatment Centre in 2014. Britain funded and oversaw the construction of six Ebola treatment centres in Sierra Leone, with the Royal Engineers overseeing the build and working with Sierra Leonean contractors and local military forces to complete them. British medics of 22 Field Hospital donning their Personal Protective Equipment (PPE), April 2015. Two British medics of 22 Field Hospital donning their Personal Protective Equipment (PPE) before going on duty at the Kerry Town Ebola Treatment Centre, April 2015. Wearing PPE was vital in trying to prevent healthcare workers from contracting Ebola. The British military medics who worked at Kerry Town staffed a small specialist part of the Ebola treatment centre that was primarily there to care for healthcare workers and staff tackling the outbreak. This aimed to provide reassurance to healthcare workers to continue coming to assist with the crisis. Example of a 'tippy-tap'. WS 1132. This 'tippy-tap' is an improvised device for washing hands with chlorinated water, to help reduce the spread of the Ebola virus. This example was donated by Brian Jones, the recent head of the International Security Advisory Team (ISAT) in Sierra Leone, one of many organisations that helped to coordinate the country's response to Ebola. Setting up medical checkpoints and closely monitoring movement of people within the districts of Sierra Leone were vital in helping bring the virus under control. Multi-terrain pattern (MTP) shirt worn by Lieutenant Andrew Jenkinson. WS 1233. This multi-terrain pattern (MTP) shirt was worn by Lieutenant Andrew Jenkinson, who commanded a platoon of 3rd Battalion, The Rifles in Sierra Leone between January and May 2015. His platoon was split into small teams that were attached to District Ebola Response Centres (DERCs) throughout the country, where they worked closely with local forces and civilians to help coordinate the response in those areas. Healthcare workers go to collect a suspected Ebola patient from a village in the Kono District of Sierra Leone, January 2015. Two healthcare workers go to collect a suspected Ebola patient from a village in the Kono District of Sierra Leone, January 2015. This photograph was taken by Lance Corporal Andrew Mitchinson of 1st Battalion, The Royal Regiment of Scotland. He and other men of his unit were deployed to the local area and on this occasion visited a village that had been partly cordoned off. Sadly the young woman who was evacuated to a healthcare facility later died of Ebola. The Second World War saw significant medical developments and refinements. These ranged from the use of penicillin to the widespread availability of blood transfusions and the first use of aircraft for evacuation. 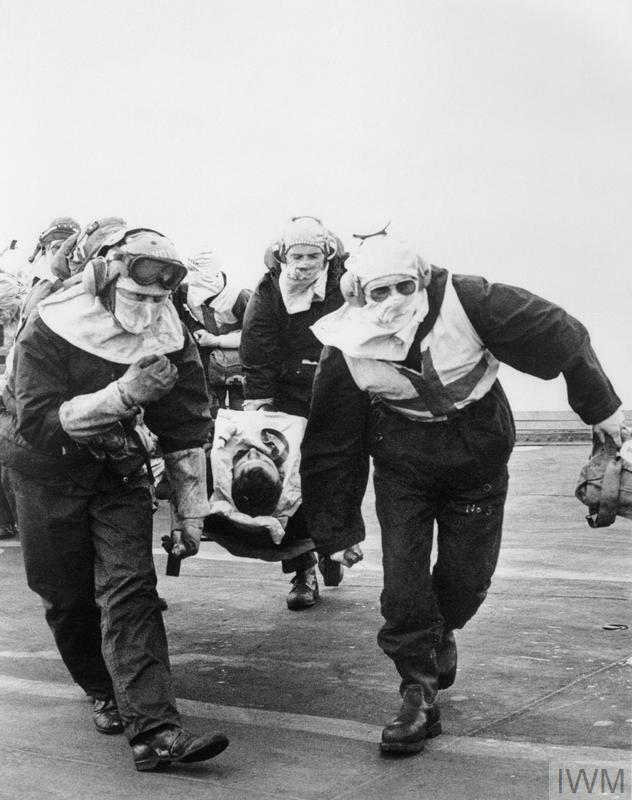 The last 70 years have seen further developments that have improved casualty survival rates in times of conflict. The rise of the extremist Islamic group ISIS (Islamic State of Iraq and al-Sham) became front page news in 2014. After ISIS quickly and brutally took control of parts of Syria and Iraq, an international coalition formed to combat their progress. Operation 'Shader' is the British contribution to this coalition.